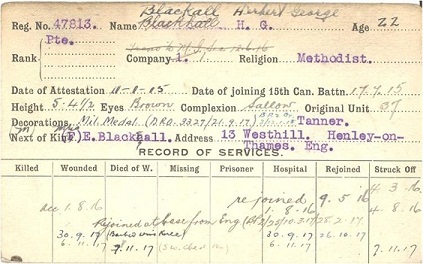 Beginning in 1914 and throughout the course of the war, the 15th Battalion maintained personnel records on all men assigned to the Battalion on 3 ½” x 5 ½” index cards called Record of Services cards. These cards recorded basic personal information on each soldier and then carefully documented all of his service activities while he was on strength of the Battalion. Every card tells a story and cumulatively they tell the story of the Battalion at war. Fortunately the vast majority of the 15th Battalion’s Record of Services cards survived the war and remain perfectly preserved in the archives of the 48th Highlanders Regimental Museum in Toronto, Ontario. 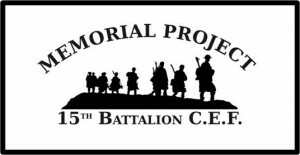 All of these cards were digitally scanned by the 15th Battalion Memorial Project and are available on this website. Although we cannot state with absolute certainty, the use of these Record of Services cards was not limited to the 15th Battalion. Several cards were found with the front side field entitled “Date of Joining 15th Can. Battn printed instead with “14th Can. Battn.” So as at least these two Battalions in the 3rd Brigade of the 1st Division were using the cards, it is reasonable to deduce that the cards were being used by all the units in that Brigade and likely many if not all units in the CEF. For information on how to interpret the information recorded on these cards Click on the image above. Click on the image above to view the Record of Services Card index. Copyright © 2019. 15th Battalion CEF All rights reserved. | Powered by WordPress | tpSunrise theme by Tekpals.